The recipient(s) of the Boehringer Ingelheim Veterinary Research Award will receive a $2,500 honorarium. 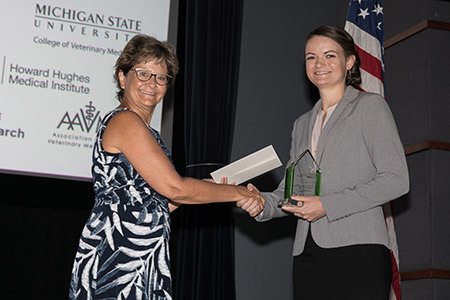 The recipient(s) of the Boehringer Ingelheim Veterinary Research Award will be invited to present their research at the Boehringer Ingelheim-NIH National Veterinary Scholars Symposium. This award is open to veterinary students who participated in the summer scholar program, attended the Boehringer Ingelheim-NIH National Veterinary Scholars Symposium, presented their work in the form of a poster, and completed their proposed project work plan by December 30th. The recipient of the Boehringer Ingelheim Veterinary Scholar Research Award will receive a $1,500 honorarium, a plaque to recognize the recipient, a travel stipend to return to the summer symposium to present their project, and recognition in the Boehringer Ingelheim-NIH National Veterinary Scholars Symposium program. 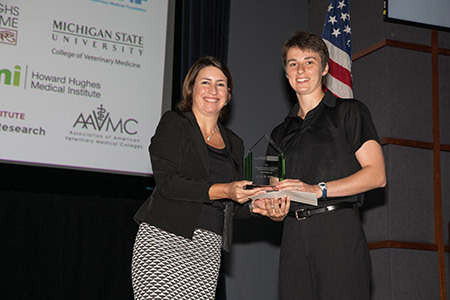 Dr. Anna Massie received the 2017 Boehringer Ingelheim Research Award for Graduate Veterinarians, presented by Diane Larsen, Head of Pharmaceutical Development Projects, Boehringer Ingelheim. The Award includes a $2,500 honorarium and an invitation to present at the current year’s Symposium. Dr. Massie received her Bachelor's and veterinary degrees from the University of Illinois. Following graduation, she completed a rotating internship in small animal surgery and medicine at Purdue University and a surgical specialty internship at North Houston Veterinarian Specialists. She is currently in her 3rd year of residency in Small Animal Surgery at the University of California-Davis. Dr. Massie presented her research on the use of bone morphogenetic protein to repair non-union fractures at the National Veterinary Scholars Symposium in Washington, D.C.
Ann DiPastina, a third-year veterinary student at Michigan State University, received the 2017 Boehringer Ingelheim Veterinary Scholar Research Award, presented by Monica Figueiredo, Director, External Innovation and Lead Finding, Boehringer Ingelheim. The award consists of a $1,500 honorarium and a stipend to attend the Symposium. DiPastina earned a Bachelor of Science in Animal Science from Cornell University in 2015. As the recipient of the Boehringer Ingelheim Veterinary Research Scholar Award, she presented the work that she completed in the summer of 2016 under the guidance of Yrjö Gröhn as part of the Cornell University Veterinary Investigators Program.